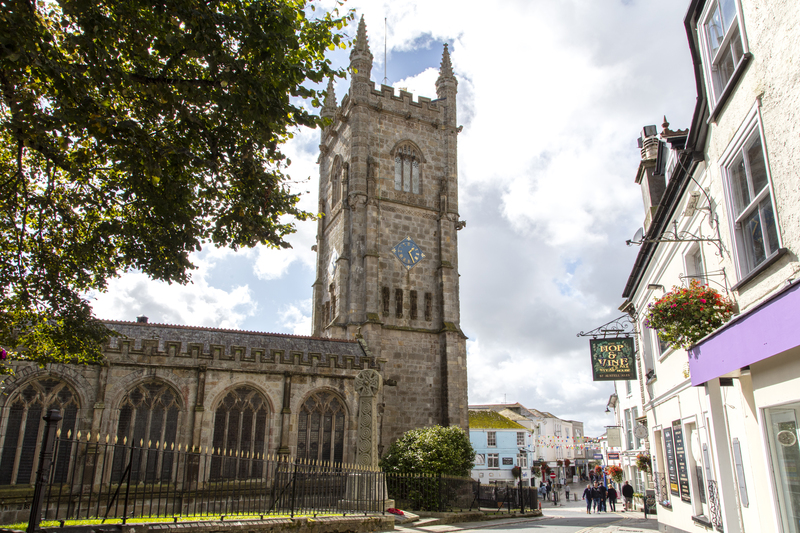 Referred to as the Cornish Riviera, St Austell is an old market town not far from the beautiful South Cornish coast line. It is the largest town in Cornwall and overlooked by the white peaks of the China Clay industry. Holy Trinity (above) is an ancient Grade I Listed church and is unusual as parts date back to the C13th. The three-stage tower is one of the finest in Cornwall and worth a visit. It dates from 1478 -1487, and together with other parts of the building, uses the local Pentewan stone. The stone is minedat the nearby village of Pentewan; it is a fine-grained granite and very durable. But, it is also goodfor fine carving. As we can see from the picture, its pinky-yellow tones make an attractive building. For centuries, Cornish people have used Pentewan stone for churches and other important buildings. The corners of the upper stage of the tower have notable crocketed (hook shaped) pinacles purely for decoration. On a church without a steeple, the elaborate tower crowned with pinacles makes quite an impact! Also, there are examples of gargoyles and other fine carving on the building. As the picture shows, the aisles and tower are embattled – this is always a sensible precaution on the coast. Nothing was spared in the build, and we can imagine the Wow factor this elaborate tower had in the C15th. Along with Holy Trinity, also in the heart of the town, is the Market House with its renaissance style fa-çade and grand arcade. Christopher Eales designed it in 1844, he also designed other civic buildings in the town. The Victorians used Carn Grey granite, the palest colour granite in Cornwall, and other local stone for this building. These buildings occupy pride of place in the town centre where the lay out of the medieval streets is clear. Here, visitors can enjoy a the riverside walk and view the historic old bridge. St Austell also has a rich railway heritage from the days of Brunel and the Great Western Railway. An unusual sight is the old granite piers of Trenance viaduct designed by Brunel, which stand in front of the later viaduct. There’s also a signal box, a goods yard, bridges and other railway structures. The Pentewan Trail is a 4km, mostly flat, walking and cycling trail from St Austell to Pentewen. The main path follows the track of a former narrow-gauge railway. But, there are also footpaths going off by the White River, or to the Woodland Trust’s King’s Wood. 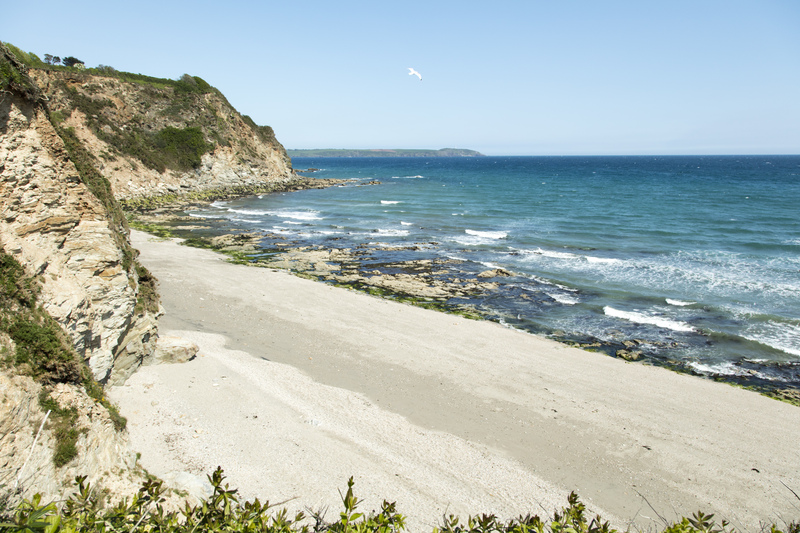 St Austell Bay is a haven for water-sports. Polkerris beach is a popular harbour beach offering water activities and facilities making it great for families. If a more secluded area is something you’re after Hemmick Beach is 9 miles from the town. 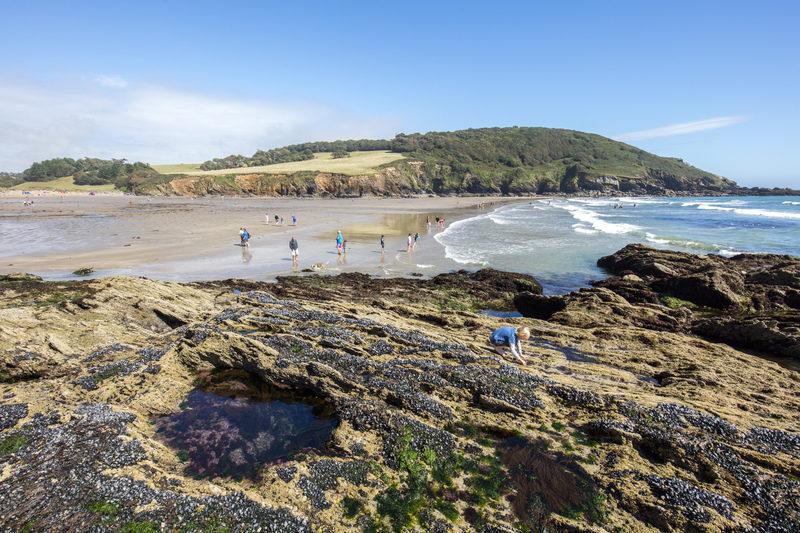 Explore the tiny coves on the secret beach then relax and enjoy the Cornish sunset. Charlestown harbour is a pristine example of a late Georgian working port. Charles Rashleigh developed the port to cope with the growth of local mining. Eventually it became the hub for exporting China Clay. 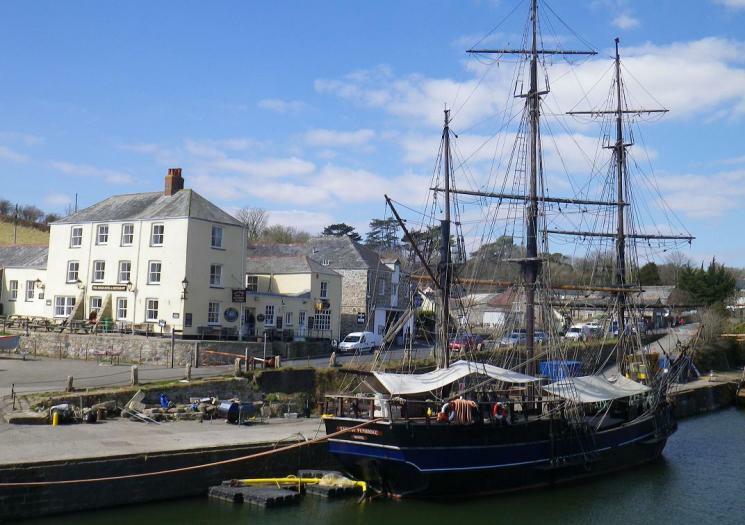 Today it remains unspoilt, and because of its unique charm the harbour has been used in film and tv programmes. The discovery of China Clay in the local area is what put the mining town on the map. The China Clay industry began declining, leaving pits in the area. 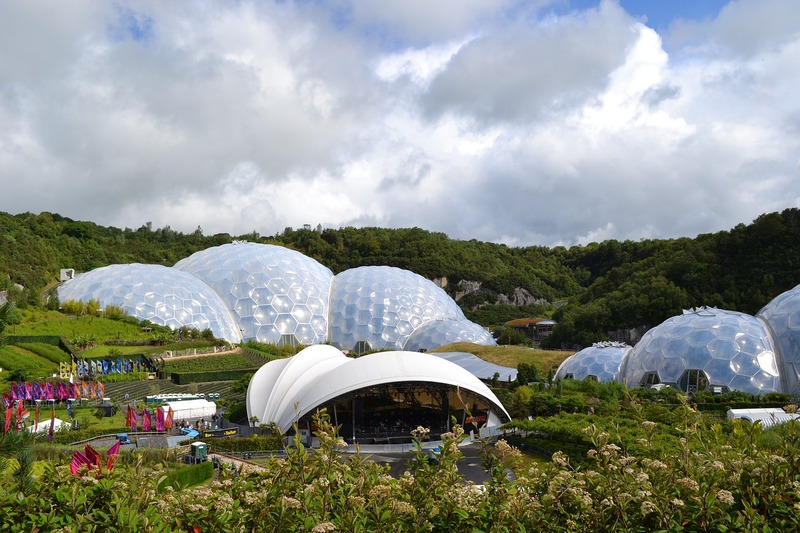 In 1995 the Eden Project began to transform one of the clay pits. In 2001 the famous biomes opened their doors to what the Times called ‘the eighth wonder of the world’. The rainforest biome is the largest in the world, including plants from four tropical environments. The other biome is home to over 1,000 Mediterranean plants! Besides mining, brewing is another local, historical industry. Founded in 1851, St Austell Brewery is Cornwall’s oldest family brewery. 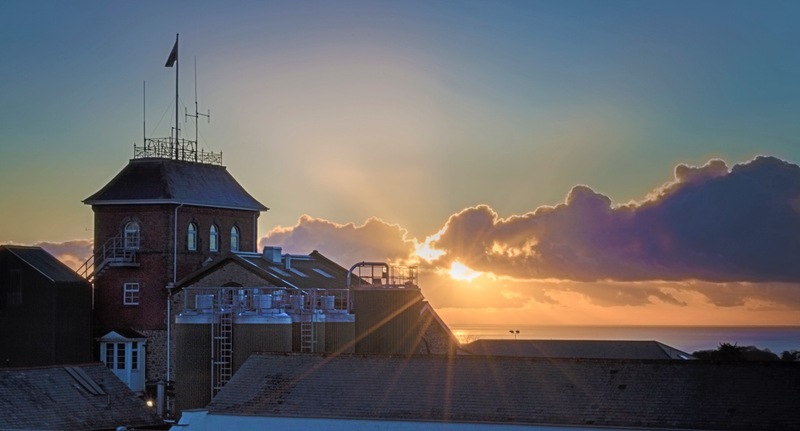 The brewery has been brewing on the same site for over 100 years and is Cornwall’s largest brewer. The visitor centre allows visitors to interact with the brewing experience. Make sure to take the tour of the brewery while visiting the town. Walter Hicks Brewery was first a small-scale domestic business. But, in 1869 Hicks increased productivity by building a steam-powered brewery at Tregonissey House. In 1893 he re-located the brewery to Trevarthian Road, the site of the present-day St Austell Brewery. Next PostGrantham in the heart of England, always in the thick of it.